Discotheque-ing calls for a special kind of dress - fluid for Go-Go action, low-necked and sleeveless for strenuous dancing. These styles - one to crochet, two to knit - may also be worn at more sedate parties. Left: Go-Go Scalloped Dress. Swinging blue dress has crisp crocheted scallops... Dress gleams as she dances. Center: Fringe-Trimmed Dress. Tossing fringe on bottom and tab of blue dress set the "with it" mood. Right: Discotheque Baby Dress. High-waisted "Baby Look" dress, favored by young London discotheque-ers. 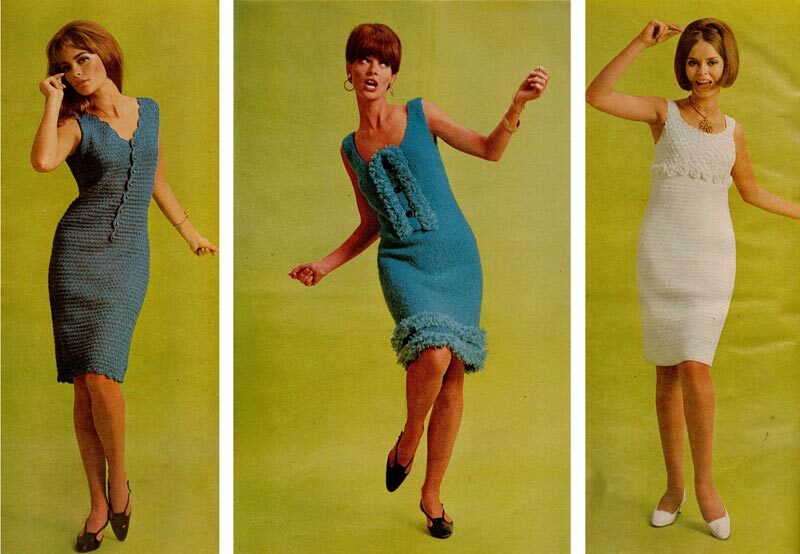 These vintage dresses were meant to be created at home, a popular and productive hobby in the mid-1960s. And despite the descriptions, these dresses are more suited for the office than the discotheque, though the look echos a swinging London style. For a really authentic go-go look, shop for psychedelic prints, flared bell sleeves, chain-link details and thigh-high hems. Think Laugh-In and you've got the right idea. Today you can find 1960s dresses and more daring vintage mini dresses on our website - no knitting needles required!